A scenic design sculpture for Act 2 of Minnesota Opera’s 2016 production of Tosca. Design by Lorenzo Cutùli. Tosca, which opens this Saturday at the Ordway Center for the Performing Arts, is one of the most lethal operas in the standard repertoire. Les Troyens‘ mass suicide of Trojan maidens kills off more characters in absolute terms, but by the time the curtain descends on Tosca only two of the six named characters are left alive – and the living are definitely more minor. Of the characters who sing arias, only the nameless shepherd boy actually makes it through…saved, perhaps, by only singing from offstage. As things go, characters have a better chance of making it through an episode of The Walking Dead than surviving Tosca. 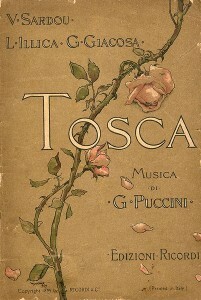 The cover of the original 1899 libretto of Tosca. 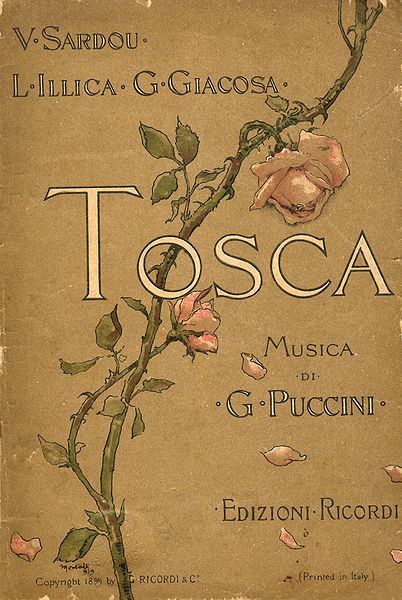 Composer Giacomo Puccini famously wrote that he was “busting his balls” writing Tosca and left the correspondence to prove it. 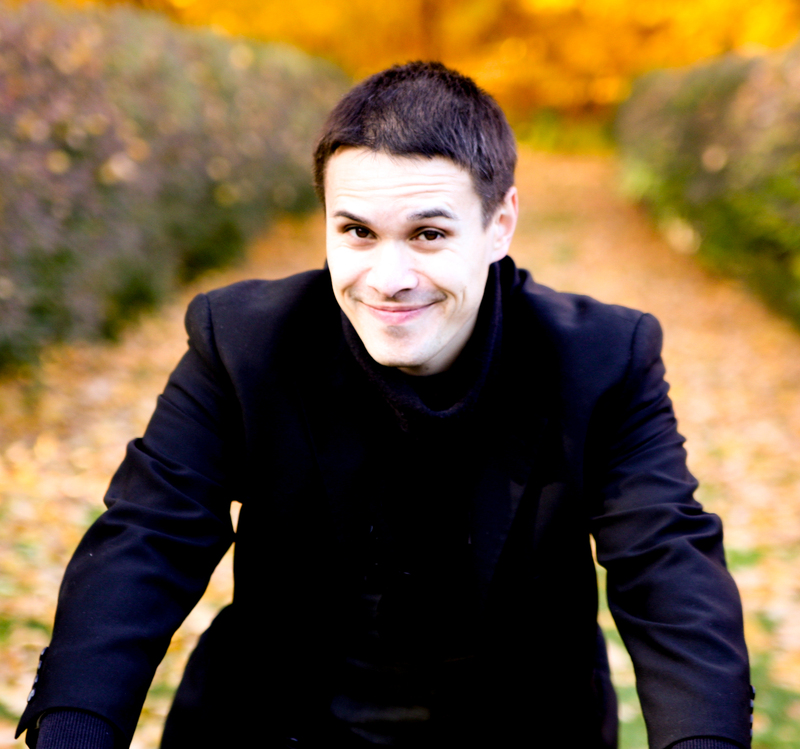 He battled with the playwright whose work he was adapting, argued with his long-time publisher and producer, and had less than three weeks’ rehearsals to prepare the opera. To make matters even more stressful, the high-stakes production opened Rome in the middle of a massive pilgrimage, with threats of anarchist bombings and a legitimate fear that Puccini’s rivals would stage a riot at the premiere. None of these factors prevented the composer from writing one of his finest scores. One of the most famous arias in Tosca, “Vissi d’arte” (“I have lived for art”), was almost cut from the opera – not because it didn’t work well, but because it worked too well. Puccini was worried that the aria would totally arrest the work’s dramatic flow, ruining the sense of drama and knocking the audience out of the moment with waves of applause. Puccini’s instincts were not wrong – more than a few productions have been brought to a halt by thunderous applause at this juncture in Act 2 – but “Vissi d’arte” was retained and opera fans everywhere have been happy since. As the titular Tosca despairs and asks why God has abandoned her to the villain Scarpia, her helplessness heightens the sacrilegious tones of Scarpia’s earlier “Va, Tosca” – one of the greatest villain arias in opera. 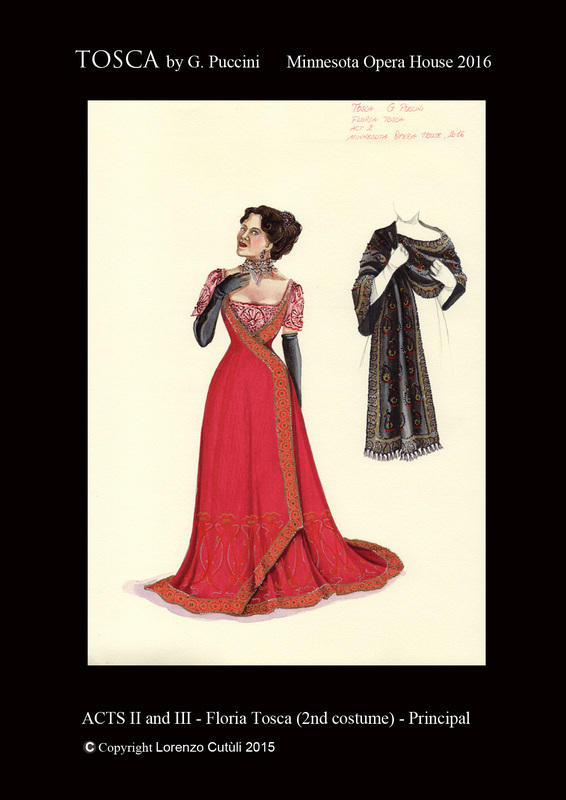 Lorenzo Cutùli’s design for one of Tosca’s gowns. Read staff reviewer Lydia Lunning’s remarks on Kelly Kaduce in Minnesota Opera’s 2016 production of Rusalka. Minnesota Opera’s production of Tosca opens this Saturday, March 12 at the Ordway Center for the Performing Arts and plays through March 26.